As a light and versatile metal, aluminium has been serving humankind well since Humphry Davy identified it 200 years ago. 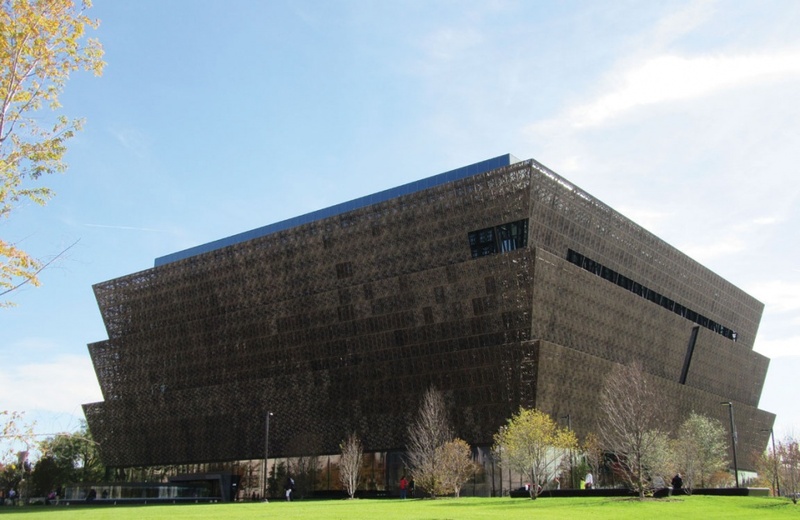 A recent exemplar is the David Adjaye-led design of the National Museum of African American History & Culture (NMAAHC) which had over one million visitors in the four months following its opening in September 2016. Its form was inspired by the 1884-completed Washington Monument, which is capped with a pyramid of cast aluminium – the oldest civic use of aluminium in the world. 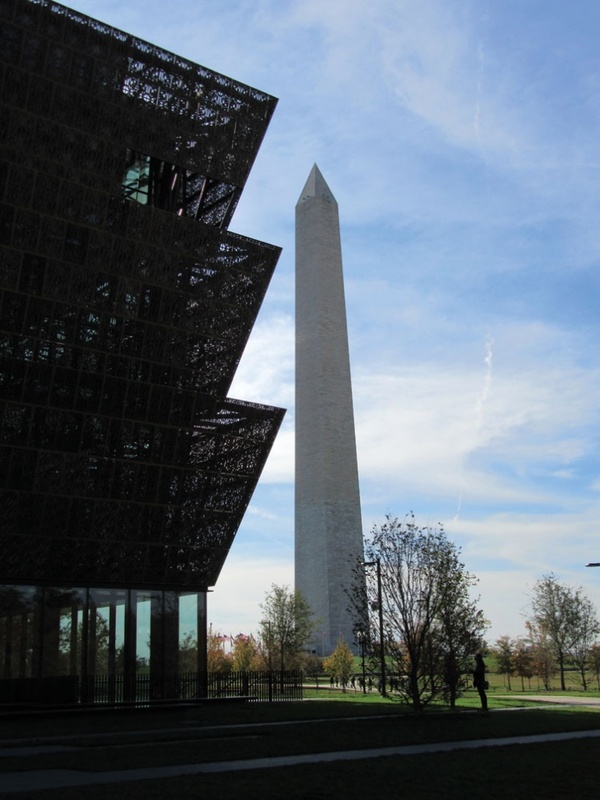 NMAAHC is clad in cast aluminium inclined at 17°, an inversion of the form of the monument. The cast aluminium cladding is treated as a universal system on all four facades. However, its primary role is to act as solar shading. The corona of the building, the visible part of this museum, comprises three tiers of cast aluminium panels, all painted with bronze coloured PVDF (a specialist plastic produced in this case by Dura Industries). 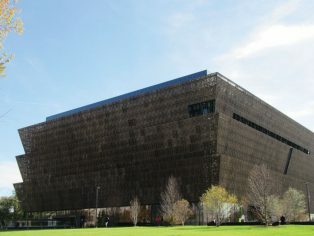 The cast aluminium panels of NMAAHC draw on the metalworking traditions of freed African-American slaves, especially in southern American cities such as Georgia, Charleston and New Orleans. This is part of a wider tradition from cast iron facades such as Louis Sullivan’s Carson, Pirie, Scott and Company Store, 1899, to the cast aluminium spandrel panels used by the architect Shreve, Lamb and Harmon to clad the Empire State Building, New York, 1931. Adjaye selected cast aluminium cladding for its durability, responding to the Smithsonian’s requirement for a 50-year guarantee. The lightweight of the cast aluminium panels enables four workers to bolt on a panel and if necessary disassemble it. Aluminium castings are typically almost 100 per cent recycled content, with just a few primary elements used to balance the chemical composition of the alloy. Recycled aluminium only requires 5 per cent of the energy input compared to primary production. Aluminium is almost infinitely recyclable, and in long-life products such as the components of architecture and infrastructure recyclability is more important than recycled content. The Towards Sustainable Cities (TSC) research undertaken by our practice working with KieranTimberlake, for the International Aluminium Institute, has identified a significant use of cast aluminium components in architecture and infrastructure. The TSC research has established that aluminium has always been recycled, and its monetary and energy value have always been well understood. The aluminium structure and cladding of the Dome of Discovery designed by architect Ralph Tubbs and engineers Freeman Fox & Partners for the 1951 Festival of Britain was fully recycled when Winston Churchill insisted it was disassembled in 1952 (it could have been reassembled on the site of the Crystal Palace). Collection rates for aluminium at demolition of buildings are very high – a study by TU Delft demonstrated collection rates for aluminium in the UK and Europe of between 92 and 98 per cent. The aluminium industry is a key component of a circular economy and it always has been, even before this term was coined. 75 per cent of all the aluminium ever produced since 1886 is still in use, or is available to be used by humankind. In contrast, the UN in 2018 identified that 79 per cent of plastic waste ever produced is in landfill, with a recycling rate of only 5 per cent. Materials need to be used wisely, validated by Life Cycle Assessments (LCA), and durability should be fully considered. Heelis – the National Trust Headquarters Building in Swindon designed by Feilden Clegg Bradley Studios is clad in cast aluminium solar shading. Here recycled content is balanced by 8 to 10 per cent silicon, to achieve the chemical analysis required by British and European Standards for the specified alloy, LM6M. Novacast, 27 miles away in Melksham, cast this solar shading. When specifying aluminium components produced using other fabrication techniques it is unwise to request more than 35 to 50 per cent recycled content, as this is the current limit of global supply of recycled aluminium, unless you can set up a specific local closed loop. Oliver Moos, MD of Gautschi Engineering GmbH, observed in 2015: “Approximately 47 per cent of the aluminium processed annually is made up of recycled material.” Norsk Hydro, in its plant at Holmestrand, near Oslo, recycle aluminium drink cans from the UK into rolled aluminium alloy sheet used to form standing seam roofing. They produced the roof sheeting of both the Velodrome and Aquatic Centre for the London 2012 Olympics. Aluminium alloy standing seam roof systems offer architects and building owners rapidly assembled roofs that are affordable, reliable and durable. A key question for specifiers of aluminium alloys in the 21st century is where the aluminium comes from, and the power generation mix of that region. It is possible within a performance specification for a building to successfully request only hydroelectrically produced aluminium. We achieved this on the rooflights on a major office building in England, working with architects Bennetts Associates. The aluminium extrusions of the rooflights were sourced, using a competitive tender process, from a region that uses hydroelectric power to smelt aluminium – Québec, Canada, where the power mix is 96 per cent hydroelectricity. This saves 500 kg CO2 equivalent when compared to the global power mix. 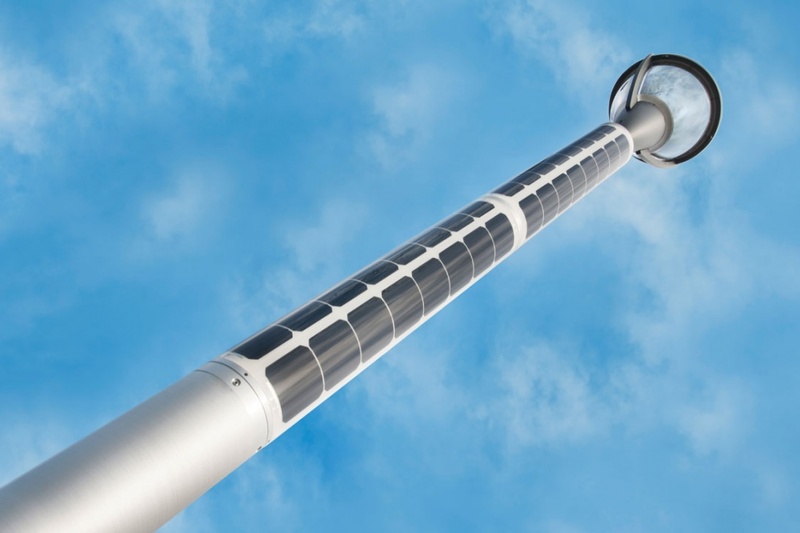 Sapa’s collaborative Soluxio Solar Lamppost is modular, designed for disassembly (DfD), solar powered, highly integrated and equipped with intelligent sensors and locators. It is also an exemplar of a circular economy. It utilises aluminium circular aluminium extrusions to make the lamppost structurally efficient, slender, elegant and aerodynamic. It integrates solar cells in a circular glass enclosure which is not dependent on orientation, thus lampposts can be placed as needed to provide street and pavement lighting. FlexSol, the company which markets the lamppost, will collect and recycle existing posts and in turn the Soluxio can be relocated and or recycled readily, being DfD. As a mode of design thinking, DfD can enhance architecture, as architect and supply chain need to think through the assembly process. The Hive, designed by artist Wolfgang Buttress is a project that both raises awareness of ecology in terms of the plight of the honeybee, and is an exemplar of DfD. The UK pavilion at the Milan Expo 2015, it was assembled by Stage One in just six months, including groundworks. Comprising almost 170,000 waterjet cut aluminium components, its bolted assembly facilitated its relocation to the Royal Botanical Gardens, Kew, in summer 2016. Originally considered temporary, Buttress discussed the possibility of it having a final journey to a public park in Nottingham, where his studio is based. However, the Hive has been credited with raising attendance at Kew Gardens by 40 to 45 per cent and a planning application was logged with Richmond Council to make it permanent, subsequently granted this June. Its cultural value makes it more valuable than the sum of its environmental impacts. Aluminium is very versatile – offering design flexibility and durability. It can be used to make an iPhone, Lord’s Media Centre, or a housing for experiments that examine the fabric of the Universe at the Large Hadron Collider. Architecture is more than packaging; in a confusing world littered with ephemera, it can provide an authentic voice. It can be both profound and purposeful.